Marijuana: Bigger than booze one day soon? Taking the pulse of U.S. factories… the marijuana mailbag… Rickards’ next book… and more! Oy. Here we go again. 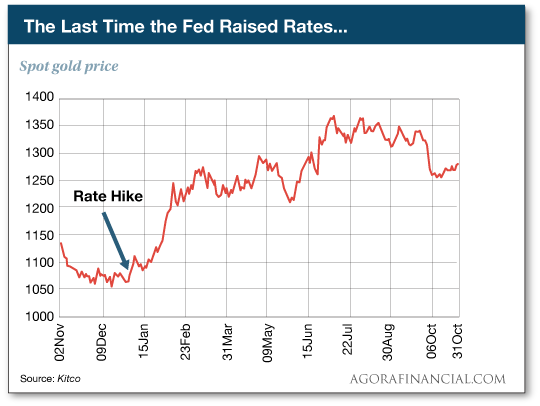 Then too the thinking was that if evidence of inflation prompted the Fed to raise rates, it would be a boost for the dollar — and, ergo, a kick in the teeth for gold. Last December, the Fed executed its one and only rate increase in the post-Panic of 2008 era. The move nearly coincided with a six-year low in gold at $1,050. As we check our screens this morning, the Midas metal sits at $1,285. As we pointed out yesterday, the mainstream is assuming that once the Fed raises rates again next month, it will keep doing so into 2017. But that’s what we were told when the Fed raised rates a year ago. It didn’t pan out then, and it won’t pan out now. Once that realization sets in, the whole higher-dollar-lower-gold thesis starts to fall apart. And that will clear the way for gold to reclaim its highs from this past summer… or soar even higher. 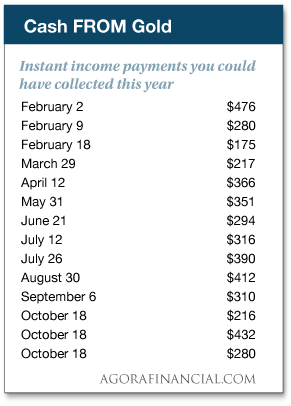 You could have collected these payouts while gold was soaring earlier this year… while it was meandering in late summer/early fall… and after gold’s big drop in early October. The major U.S. stock indexes remain stuck in yesterday’s holding pattern. The Dow is off 24 points at 18,118. Treasury yields are drifting higher, the 10-year at 1.87%. As noted above, gold is clambering back to a four-week high. It being the first of the month, we’re getting a read on the health of the U.S. factory sector with the ISM manufacturing survey: It inched up last month to 51.9. About the best that can be said is that it marks two straight months with a reading above 50 — which is the dividing line between a growing factory sector and a shrinking one. For once, the big merger-and-acquisition news is about a deal that won’t happen: Newspaper publisher Gannett is giving up its unsolicited bid for the company formerly known as Tribune Publishing. As we noted months ago, one of the maneuvers Tribune used to fend off the takeover was to change its name to tronc. Hey, it worked! “It looks like oil traders are getting a little tired of OPEC’s shenanigans,” writes Greg Guenthner in today’s Rude Awakening. 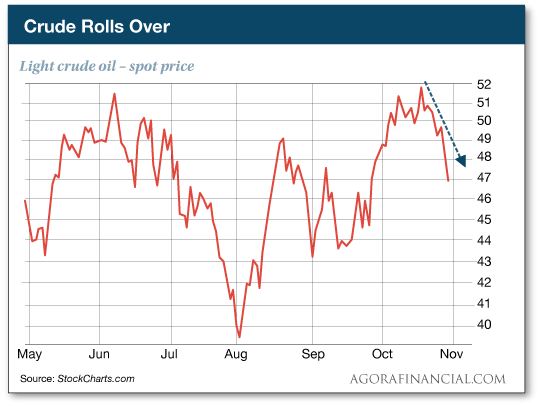 Since early August, crude has risen steadily with each rumor that OPEC nations were on the verge of agreeing to a production cut. (Uh-huh.) At one point, they had an agreement in principle — but it wasn’t supposed to take effect until this month. (Yeah, right.) They were supposed to hammer out the details during a meeting in Vienna last weekend. (Pull the other one!) And they failed. Never underestimate the value of cash in a portfolio, says Jim Rickards. Jim reinforced the point yesterday to readers of Rickards’ Strategic Intelligence — noting that portfolio managers at several large institutions are recommending cash right now. Chief among them is Mohamed El-Erian of Allianz, one of the world’s biggest insurance companies. “The reasons given,” said Jim, “include uncertainty surrounding the U.S. elections, overvaluations in stocks and falling bond prices as interest rates begin to rise around the world. Cash also gives you choices — or in finance parlance, optionality: “If other investors change their minds about portfolio composition, it can be costly to exit stock and bond positions in a market panic, whereas the holder of cash is always ready to swoop in and pick up bargains when the opportunity presents. Could sales of legalized marijuana one day overtake sales of alcohol? No, this isn’t about the cannabis measures on the ballot in California and eight other states next week. This is about Canada… where the government of Prime Minister Justin Trudeau plans to introduce a bill legalizing and regulating weed next spring. The consulting firm Deloitte has issued a report saying legal pot in Canada could be a $22.6 billion business — more than beer, wine and spirits combined. “There hasn’t been anything like this — and granted it wasn’t legislated — but you think of the dot-com… flurry, it has that kind of feel to it,” Deloitte’s vice chair Mark Whitmore tells the Toronto Star. Hmmm… Canada’s population is 35.2 million. California’s population is bigger — 38.8 million. And as we’ve been saying for days now, California voters go to the polls a week from today to decide whether recreational marijuana will be made legal in the Golden State. No wonder our Ray Blanco is seeing dollar signs for people who get into a carefully chosen basket of “penny pot stocks” in the next week. If you haven’t checked out his research yet, time’s starting to run out. “Here’s an idea,” writes one of our longtimers weighing in on our weed thread: “If you think marijuana is harmful, don’t smoke it (smoking is not the only delivery mechanism, BTW). “Why are so many so determined to run other people’s lives? “I do not use marijuana, but I fully support others’ right to do so, with the usual caveat of not interfering with my rights. “I’ll take any unintended consequences over government meddling and control. Every ‘war’ that the government has decided to execute has resulted in vast human tragedy and even greater squandering of capital. “After a half century of wars on drugs and poverty, there is nothing positive to show for it. Instead, we have more people imprisoned than Russia, North Korea and China combined and trillions flushed down bureaucratic black holes. “It’s amazing to me that so many seemingly intelligent people continue to support these failed policies. “I smoked marijuana from Thanksgiving Day 1970 until sometime in 2012,” writes another. “I don’t remember the date that I quit smoking it on. It wasn’t a big deal when I quit. It was just something that happened. “I have just started smoking it again, just a little just to see what it’s like, because of all of the notoriety it has been getting lately. “It isn’t physically addictive — however, it can be psychologically addictive for some people. I’ve known people who had smoked so much pot they became airheads. Not even knowing what day it is. These cases are few and far between and not the norm. It’s the same as someone drinking themselves to oblivion. “Marijuana isn’t the danger drug that the government and others have tried to make it out to be. It will be discovered that it’s more beneficial than anyone ever dreamed that it would or could be. “More pharma companies will get on board as the legalities get worked out, and there will be more money made from this plant than any other. “… but I must admit that I have this feeling that the SDR [the International Monetary Fund’s ‘world money’] will encounter speed bumps that will hasten its demise in favor of gold as a global reserve currency. “In fact, I see a big bump in the road that is more like a jump with a misplaced landing ramp, at best. I refer to the demise of the euro. “Can you imagine the haggling at successive G-20 meetings as European countries pull out of the EU and try to re-establish their sovereignty and old currencies? Bundling various currencies into the euro was easy, as was inserting the euro into the SDR to replace them, but this can of worms will be hard to untangle and will not be done by a single quick dispatch this time around. P.S. What if the secret to getting rich quick is hiding inside this obscure FINRA document? When world-renowned trading strategist Michael Covel told us about this, we thought it couldn’t be real. But then he showed us proof… after proof… after proof… and it STUNNED everyone in our office. If you’re looking for a way to grow your nest egg as fast as possible, we urge you to check this out immediately.